I came up with this chicken recipe on a whim one night last week. I knew that I wanted to make a Pineapple Teriyaki sauce (recipe to come! ), and wanted some deliciously crispy chicken to go underneath. This worked out perfectly on the first try (don't you love it when that happens...) & I knew it had to be shared soon! I took to Instagram & Facebook for some feedback from you guys, and you agreed! So I bumped this up to the top of my "to-post list" and am here to share it with you today. It's amazing how all of the chicken pieces-- both breasts and thighs-- cooked perfectly at once. I did a quick pan-fry at the beginning to get the browning started, but this can also be done solely in the oven to simplify the process. 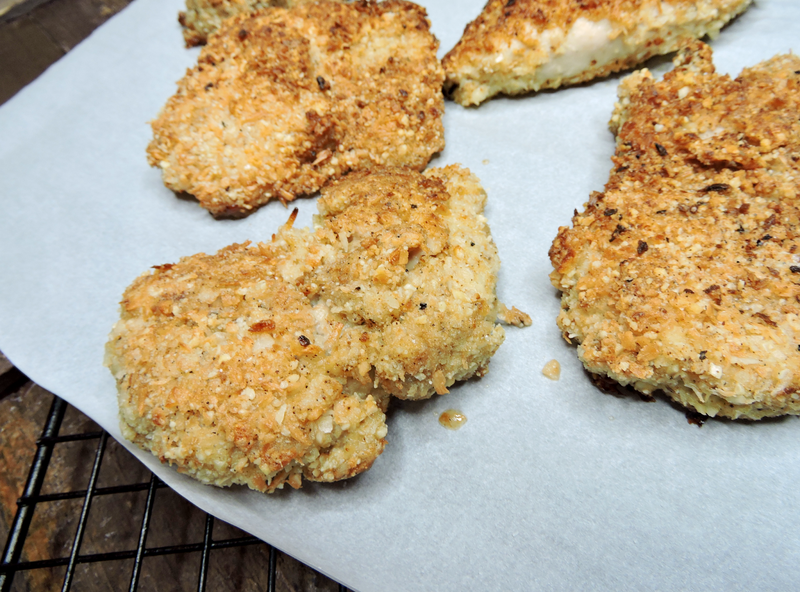 Try this recipe on the Whole30, or any time: for tenders, nuggets, and more! I think you & the WHOLE family will love it. P.S. Don't forget to see my notes below for making it extra crispy with one extra step (a quick pan-fry). Preheat the oven to 375ºF. Line a baking sheet with parchment paper and set it aside. Whisk an egg in one bowl. In the other bowl, combine the almond flour, shredded coconut, and spices. Dip the chicken into the egg, then flip to coat on both sides. 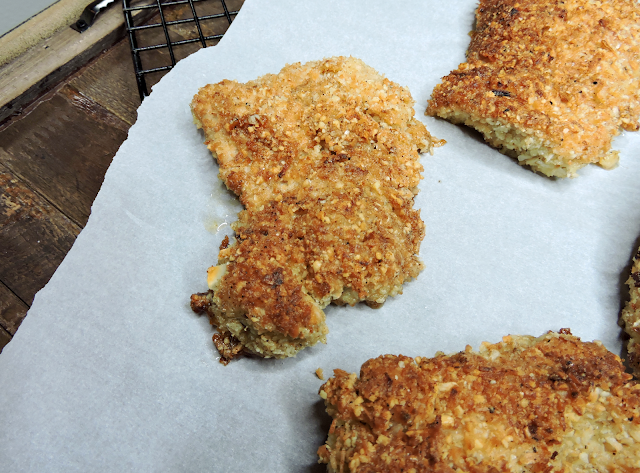 Press the chicken into the coating mixture, then flip & repeat to coat both sides evenly. Lay the chicken onto the parchment-lined baking sheet. 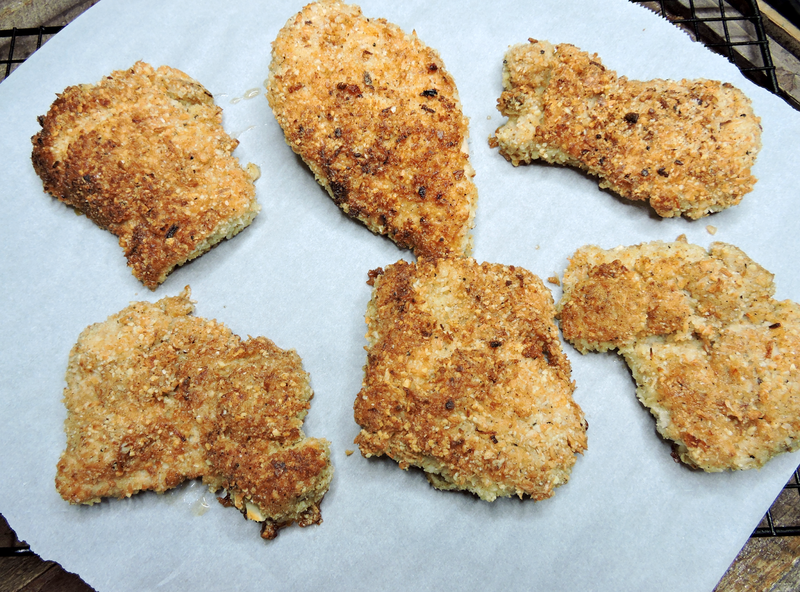 Once all of the chicken pieces are coated, give them an even mist of olive oil spray to help them brown. Bake for 20 minutes to cook the chicken through. If you want more browning action, try turning on the broiler for the last few minutes. Remove from the oven, sprinkle with a little extra sea salt, and serve hot! I use a "Misto" refillable mister where you add your own olive oil. You can use whatever cooking spray you like. After step 2 is complete, heat 3 Tbsp of coconut oil in a large skillet over medium high heat. Cook the chicken in batches (so you don't crowd the pan) for 2-3 minutes on each side (just long enough to brown; but not to cook through). 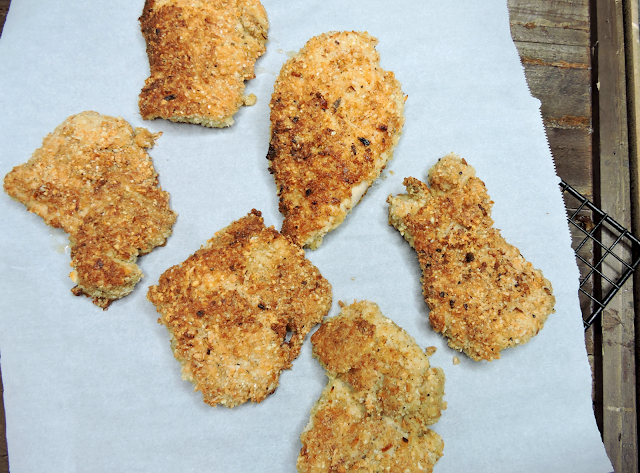 Lay the chicken out on a parchment-lined baking sheet, and bake at 375ºF for 10-15 minutes to finish cooking through. Finish with a sprinkle of sea salt & serve! This looks awesome! I really like that crunch factor too so I'm definitely gonna try this! This website is great. Starting the whole30 again tomorrow, and had been dreading finding new recipes for this go around. Thrilled to stumble upon your site. This was delicious! It has great flavor! Entire a very good day out as well as a ton to view together with accomplish. I'm sure Most of us possibly simply just expected pics regarding fifty percent the exact factors now there. Basically content various aficionados on the adventure now there as a way to thus howdy as a way to everyone Most of us spoke as a way to. wow, your dish looks yummy. I think I'll do it for my lunch tomorrow. Thanks for your nice recipe. I love fried chicken, and your recipe is what I need for my party tomorrow. Thank you.